Home / Security Tips / Avoid Buyer’s Remorse. Know What Makes a Commercial Video Surveillance System Great. Whether you are a large, small, or midsize business video surveillance is an investment you want to consider. Not just consider implementing it; but consider every aspect of it from types of components, installation, cost, how you’ll use it, and more. Why? Because any one of many facets of ownership can impact how well your system serves your purposes. 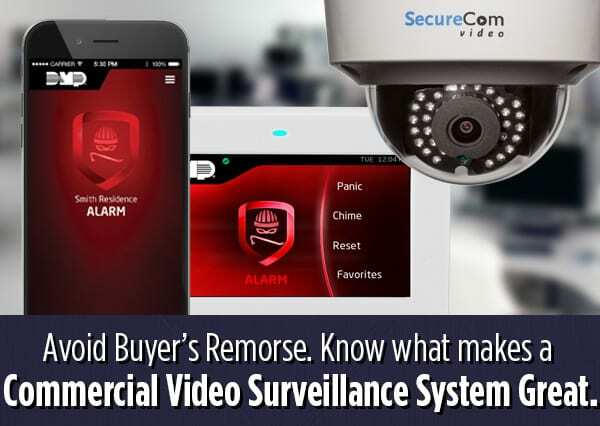 Even having a top-of-the-line video surveillance system can leave you with buyer’s remorse if your needs of use are not met. It takes years to really know video surveillance in depth, and staying on top of industry advances is a full-time job. When you work with any company, you are relying on their knowledge and expertise to get the right system done rightly. Their knowledge can expand your capabilities, or a lack of knowledge can cost you. This is why it is so important to work with a knowledgeable and reputable company. Before you even begin to look at all the great technology, look at your space and decide what you want to accomplish. Is it increased security, greater organizational awareness, or improved productivity? Or is it all of those things and more? A reputable professional will be able to help you identify your goals and make recommendations so that you do not overspend in areas that do not provide benefit. Security needs and security technologies evolve. One of the important ways you can make sure that you buy the right video commercial surveillance system is to consider both of those things now. A reputable professional will work with many manufacturers and can recommend ways to utilize existing system components and how to build a system that extends the use of new components. A great system will be scalable and offer third-party integrations. The longer (and wider) your system serves your needs, the lower the total cost of ownership. There are many manufacturers out there offering a multitude of different cameras with various and different combinations of capabilities. In some cases, it can save you to have a more capable camera in one area than in others, or in some cases, it makes sense to have one camera to cover a large area instead of multiple lesser cameras to cover the same space. There is a wide scope of capabilities being offered in the industry today and it is important to understand them so you can consider how they might apply to you in the future. For example, you may not be thinking about video analytics now, but you may find a way that data can serve your business even better. What Makes Great Commercial Video Surveillance System? One that has a lot of thought behind it. Let us put our knowledge to work for you! Call us today!